Absorbin-V is a liquid binder, which is subsequently used by owners off old-timers, police and firefighters. It binds oil, gasoline, heating oil, diesel fuel, motor oil, battery acid, coolants and chemicals. 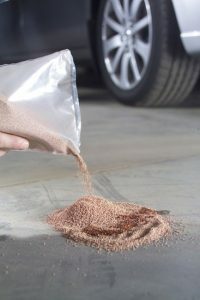 Absorbin-V offers a very simple and environmentally friendly use.